You can see by yourself the nice Seasons Greetings card that Steve sent last year! Steve commented: In the picture above you can see, on top of the car are my daughter Sarah, age 3 1/2, and son Matthew, age 6 1/2. 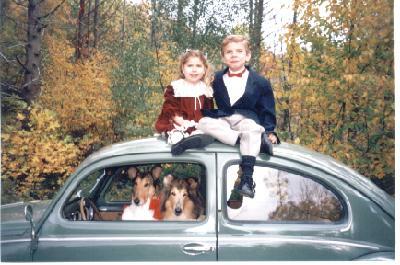 Inside the car are (left): Nick (7 year-old smooth-coated Collie), and Megan (10 year-old rough-coated Collie). The car itself is our 1950 Deluxe Sedan. 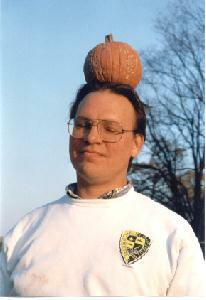 The photo was taken in October 1999. Top secret note: Steve confessed that it was quite a photo session - trying to get *all four* "kids" to look at the camera & smile at the same time! It "only" took us three rolls of film to get a good usable picture! My wife's name is Diane, and she is very much the VW enthusiast (more than me, in many ways). It was her drive & vision that led to our purchasing our 1954 Convertible back in 1984, and finding the right person to restore it (1984 through 1986), and our successfully showing it in various Antique Automobile Club of America national meets in the years since then (it has achieved AACA First Junior, Senior, and Grand National 1st Place awards in it's "career" of AACA national meets). She bought her first VW while still in college, about 1980 or so--a 1973 Super Beetle Convertible. I had *little to no interest* in VWs back then, but she knew what she liked--she still drives the car daily in the summertime (she has a '92 Passat wagon for the cold months). Well, here is my picture (better late than ever!). I apologize for the "humorous" nature of the photo - it's one of the few pictures of myself I could find. My wife photographed me when we were out looking for Haloween pumpkins this past October. Thank you again very much for all the great work you do within the international Volkswagen hobby, all the best for the new Year! Steve published some time ago the "occasionally produced and informally distributed": COMMON GEAR Antique Volkswagen Hobby News & Views. ...now he devotes his time to his Web Page. 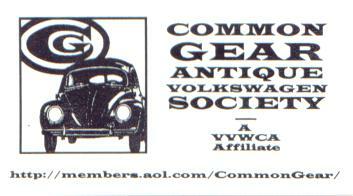 As for the nature of the COMMON GEAR WEB SITE, basically I guess it's kind of an antique VW-oriented resource for hobby news & information of all sorts. It is "self-indulgent" in many ways, as the old printed newsletter was, but it's not about me--it's about all sorts of old-VW-related stuff that I see & hear about, that I think might make for interesting web site viewing. It is also admittedly quite rudimentary, as I am *far* from an expert on this computer and web site-stuff. I have forced myself to learn enough to be able to get the web site going and keep it updated, but it is by no means any showcase for web site technical wizardry! It's fun to maintain, as it allows me to kind of "stay involved" in the antique VW hobby, even now that, with my growing family, I find myself less and less able to physically be able to get out to the various actual VW events. Steve included a Link to the "Arte & Fusca - The VW Beetle and the Pop Art" Site in his Home Page, thus allowing the divulgation of the QUEST to more people around the world, helping a lot to proceed with the work! I thank Steve very much for his participation, for his friendly support and for his kind words. It is nice to have an idealist, like Steve is, as a friend!! !